Training programs are performed by HRM of organizations to develop proficiencies and competence in order to improve performance at workplace. Most organizations perceive training as an essential part of the human resource development activity. Training and development is the ways to ensure that employees have the necessary knowledge, skills and attitudes required for their current position and that they are developing the competencies required for future positions. The main objective of training program is to improve the capability of workforce and develop employee commitment. The necessity for training and development is evaluated by the employee's performance. Human resource team constantly makes extreme efforts to discover new ways to improve the effectiveness of company staff in their jobs and equip them to adjust in challenging business environment. Theoretical studies indicated that training is indispensable and strategic when it is considered the long term objective of organization such as expansion of market (Lynton and Pareek, 2000). Training improves technical and managerial skills of workers, who are involved in major work in organization and have ability and enthusiasm to develop tacit knowledge to achieve their career goals (Johnson et al., 1996). Tacit knowledge assists in developing organizational structures, productive and innovation capabilities of an organization. Training can be given in various ways such as on-the-job and off-the job. Usually, organization provides training during the job to personnel because it helps the learning of daily operations and refines basic concepts. Of the job training is given to particular personnel who contribute to increase the intellectual capital and skills by gaining latest knowledge such as research techniques, operation of hi-tech equipment (Hara, 2003). In Self-directed training, learners complete training on their own. They decide what they will study and how they will go about learning it. Mentoring is also a means of training in which learning is from an experienced individual. To choose the appropriate form of training depends on the situation and needs of the learner and the cost and availability of training programs. Though, it is necessary to choose a type of training that the learner is comfortable with and can be successful at the training. The training will meet the stated training objectives. The training will increase the productivity, and effectiveness of the employee and the organization. Gray affirmed that training must be given in good environment where adequate returns can be anticipated. It must be accompanied by applicable incentives and working conditions so that personnel's knowledge can be fully utilized (Laursen and Foss, 2003). The important goal of training is to develop talent in the employees. Training is crucial for the success and production of companies. Many organizations spend huge amount of money on training which leads to unbeaten performance of employees, institutions and nations. Training is a methodological process of intervention to improve existing knowledge, skill and capabilities of employees. 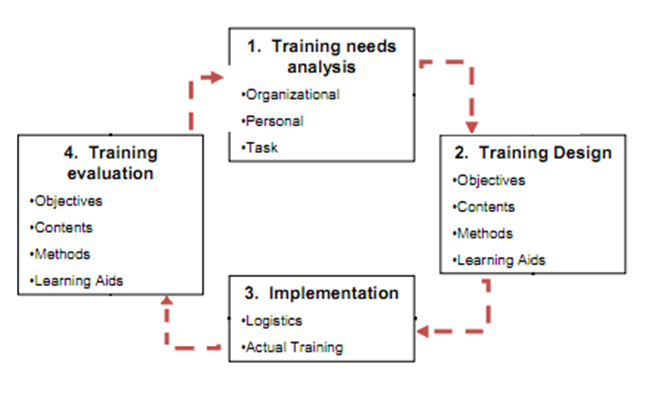 To plan a training program in order to support human resources functions in an organizational several steps that involves evaluating the need, designing the materials to support human resource professionals, developing the training program, implementing the program and assessing the impact of the program on departmental operational metrics. First step is to analyze company's human resources department operations, observe human resources professionals conducting day-to-day activities and conduct surveys to determine the type of tasks the HR department employees need the most help in developing expertise. Second step is designing training program by listing learning objectives and creating a content outline, validate assumptions by reviewing design ideas with members of the HR organization and obtain sponsorship from executive leadership to ensure program aligns with strategic goals. Third step is to develop training materials including presentations, classroom exercises and study guides, prepare a list of references and resources. Publish these to a company intranet page and communicate its availability through newsletter or social media technology. After that professionals must create a list of industry Internet links of tip and techniques. Fourth step is to execute training program by communicating its availability to all employees in HR department to ensure compliance to company policies and procedures as well state, federal and local regulations. Develop the training mandatory for new employees and provide seminars on specific changes for more experienced employees. Last step is to evaluate training program effectiveness through performing follow-up interviews, surveys, focus groups and operational analysis. Companies get competitive advantage from training and development. Training program help remove performance deficiencies in employee, making employees stay long, minimized accidents, and fulfills future employee needs. To summarize, human resource management conducts training to improve the performance of employees through a learning process by which employees develop specific skill and gain knowledge to do better and generate profit. Training involves all activities from new employee orientation to leadership training for seasoned employees. Hamblin stated that training is necessary to acquire useful response on the outcome of training program and to evaluate the value of the training with such feedback (1974). Previously, training programs were criticized because they did not provide proper feedback of training. Some organizations have limited number of managers who are given training to develop skill on particular area and evaluators are not employed to judge performance of personnel trained in specific skill. When an employee who undertakes training program, he is confident and motivated to use his talent through these program then training programs are functional for organization as well as the personnel. Training is necessary for job success. It can lead to higher production, fewer mistakes, greater job satisfaction and lower turnover. These benefits accrue to both the trainee and the organization, if managers understand the principles behind the training process. Training has vital role in the overall triumph of an organization.